Andrew Finch, a 28-year-old man from Wichita, Kansas, was killed last week in a swatting attack by police who were responding to a call reporting a hostage situation at the man’s house. All begun on the evening of December 28, two gamers bet they could complete the Call of Duty game by ‘swatting’ each other, but one of them gave the wrong address to a nearby known swatter. “The two CoD players reportedly got into an argument over a small money loss on UMG’s wager platform online (view match) and threatened to swat each other, with one of the players sending the other incorrect details of an address nearby to a known swatter, who was reportedly responsible for the CWL Dallas bomb hoax evacuations.” reported the website Dexerto. Yes, you heard right, the absurd death was the result of a “swatting” attack gone wrong. According to the popular expert Brian Krebs, the dispute originated on Twitter, one of the parties allegedly using the Twitter handle “SWauTistic” threatened to swat another user who handles the account “7aLeNT“. @7aLeNT dared someone to swat him, but then tweeted an address that was not his own. “Swautistic responded by falsely reporting to the Kansas police a domestic dispute at the address 7aLenT posted, telling the authorities that one person had already been murdered there and that several family members were being held hostage.” wrote Krebs. “Not long after that, Swautistic was back on Twitter saying he could see on television that the police had fallen for his swatting attack. 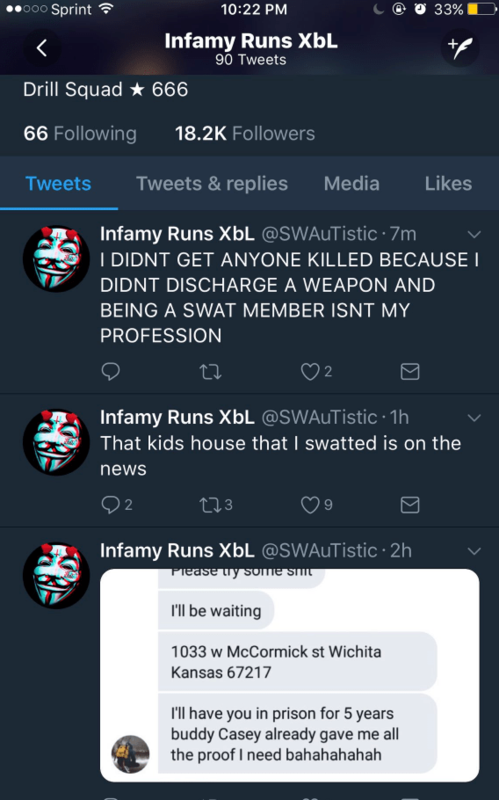 When it became apparent that a man had been killed as a result of the swatting, Swautistic tweeted that he didn’t get anyone killed because he didn’t pull the trigger (see image above). “I heard my son scream, I got up, and then I heard a shot,” said Lisa Finch, the mother of the shooting victim, in a video interview with the Wichita Eagle. Andrew was unarmed and the police did not find any weapon in the house. A typical “Swatting” scenario sees someone calls police from the target’s home and describes a fake emergency situation urging the intervention of the law enforcement. This is what has happened at the Finch’s house. “We were told that someone had an argument with their mother, and dad was accidentally shot and that now that person was holding brother, sister, and mother hostage,” a police official told reporters. According to the official, Andrew Finch “came to the front door” and “one of our officers discharged his weapon,” killing the man, but he declined to explain why the agent opened the fire. To be clear, Andrew Finch was not a Call of Duty player and he was no linked with the two gamers. The police are investigating the case to track the person who called them first reporting the fake emergency. The recording of the call to 911 operators that prompted this tragedy can be heard at this link. Swatting is a serious problem, a member of Congress has proposed legislation to combat this illegal practice. Back in 2013, the popular expert Brian Krebs was the victim of a swatting attack, fortunately with a happy ending. Barriss has a history of swatting, as reported. Police in Los Angeles have arrested 25-year-old Tyler Raj Barriss (aka “swautistic”), the man who claimed responsibility for the fake 911 “swatting” call that led to the police killing of an innocent Kansas man https://t.co/Y9CQaThMR0 Barriss has history of swatting, as reported. Previous articlehow to unblock ports on AV installed clients…..
Next articleWhat is the cyber kill chain?